Anti-war organizers say:	“We will march on the Republican National Convention…” | Fight Back! 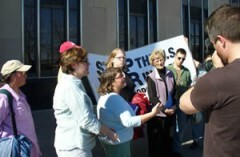 St. Paul, MN - Since the announcement that the 2008 Republican Convention would take place in Saint Paul, Twin Cities anti-war organizations and others have been making plans to hold protests against the U.S. war on Iraq. Progressive activists from around the country are coming to the convention to speak out against the war. Permit applications and payments were submitted in October 2006. After holding the applications for five months, St. Paul officials are now saying they don’t want do deal with the issue until next year. This does not work. At a March 26 press conference held outside Saint Paul City Hall, protest organizers blasted the city made it clear that they would proceed no matter what. “Bush is waging a war on the people of Iraq. Saint Paul city government should not stand in the way of those of us who will demonstrate against that war. Permits or not, we will make this clear in the streets of Saint Paul Sept. 1-4, 2008," said Jess Sundin of the Twin Cities-based Anti-War Committee and one of the organizers of the huge demonstrations that will confront the Republican National Convention. Local organizations that have signed on to the protest include the Anti-War Committee, Iraq Peace Action Coalition, Twin Cities Peace Campaign-Focus on Iraq, Women Against Military Madness, Anti-War Organizing League, the Welfare Rights Committee and AFSCME Local 3800.